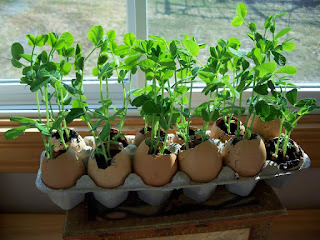 Egg-cellent idea from friend, Suki. What could be cuter than seeing little seedlings emerge from egg shells all ready to pop into the earth, nourished by the decomposing shell as the tiny roots work their way into the soil. Try it. It'll crack you up! Not really, but the seedlings will thrive. Neat, tidy storage until planting time. Easy for children to handle. And total recycling back to the earth.